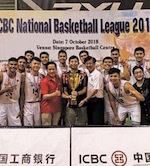 Xin Hua Sports Club crowned 2016 Champions in Singapore National Basketball League Qualifying Tournament. In the Final game they edged Sin Kee (SKC) 99-52. Xin Hua Sports Club dominated the game from the very beginning and did not allow the opponents to match them in the game. Earlier the teams dominated in the semifinal clashes. In the game for the 3rd place Nanyang CSC beat Hoops Factory 69-59.